BMW has long been a favourite of mine. I’m not sure whether my father’s lengthy period of BMW ownership (since 1977 until today) has had this effect on me or not. I still remember the mileage of his earliest BMW. It had done 330 000km on the day he parted with it – and he didn’t want to part with it, either. A head on collision (of no fault of his own) meant that he needed to upgrade. BMWs have a reputation of being finely engineered and solidly built cars. Dad’s BMW 518 kept him wonderfully safe in the collision..
BMW’s most current and smallest vehicle is the BMW 116i. The BMW 116i has a solidness in build quality that some other larger car manufacturers would envy. Even in the small BMW116i base model, you can find lavish helpings of safety equipment to keep the occupants safe in the event of an accident. Being content that you and your family have the best that BMW can offer in crash safety is a wonderful comfort when driving on today’s busy roads. The simplest BMW116i has an impressive 5 star safety rating list: both driver and passenger airbags (Impact dependent), front side airbags, height adjustable front seatbelts, ITS head airbags for front and rear occupants, pyrotechnically pretensioned front seatbelts and a seat belt force limiter. The kids in the back can travel securely in place with the three 3 point rear seatbelts that the BMW 116i has on offer. In the event of an accident, a warning triangle and first aid kit have been provided. Anti-Lock Brakes (ABS), Cornering Brake Control (CBC), Dynamic Stability Control (DSC), Dynamic Traction Control (DTC) and Dynamic Brake Control (BDC).are all standard on each version of the BMW 116i. 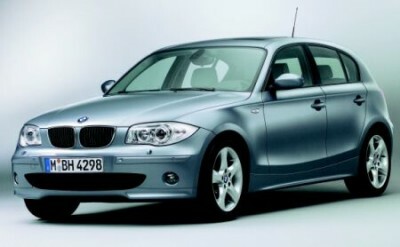 The little BMW 116i has a car design that incorporates poise, presence and grace. There is almost no overhang over the front and rear wheels, giving the BMW 116i a balance in its handling that holds the car to the road particularly well when pushed very hard mid cornering. The added joy that the little BMW116i has, like its bigger brothers, is a rear wheel drive set-up. This, of course, adds to the fun factor when driving this great little car. If you want an even sportier feel to the already impressive BMW116i, the BMW 116i M and SE models offer the M sport suspension kit. The M Aerodynamic pack and the 3 spoke leather M multi-function steering wheel are available on the BMW 116i M version for that sportier look. When sitting in the BMW 116i’s comfortable and supportive driver’s seat, a touch of a button will allow you to view your average speed, average fuel consumption, current fuel consumption or the oil level. An outside temperature display is also given. There are plenty of luxuries available to all BMW 116i versions. Each model in the BMW 116i series has electric windows front and back. The seats look attractive in either cloth or leather. A luxury leather pack is an option available to all new BMW 116i model owners at an extra cost. Power comes from a 1596cc DOHC engine unit that has double VANOS variable vale timing technology. With 85 kW on tap at 6000 rpm and 150 Nm of torque at 4300 rpm, this little motor is delightfully responsive and free revving. It may take 10.9 seconds to reach 62 mph, but in a legal situation, the driver can experience the magic 200 kph, which, when the size of the motor in the BMW 116i is considered, ain’t too bad! One can expect, on average, a respectable 37.7 mpg fuel efficiency. For a little more power, you can take a look at the 1.8 litre engine. There is a range of engines, including a very flexible 2.0 litre diesel. Yes, BMW has the slogan of “The ultimate driving machine”. And the smallest BMW does a credible job in proving that statement. For any more information on the BMW 116i, or for that matter any other new car, contact one of our friendly consultants on 1300 303 181. If you’d like some fleet discount pricing (yes even for private buyers! ), we can submit vehicle quotes requests out to our national network of BMW dealers and come back with pricing within 24 hours. Private Fleet – car buying made easy!